Banana is one fruit that cannot be easily forgotten by people. it is the most popular fruit in the world. The banana is, in fact, not a tree but a high herb that grows up to 15 metres. 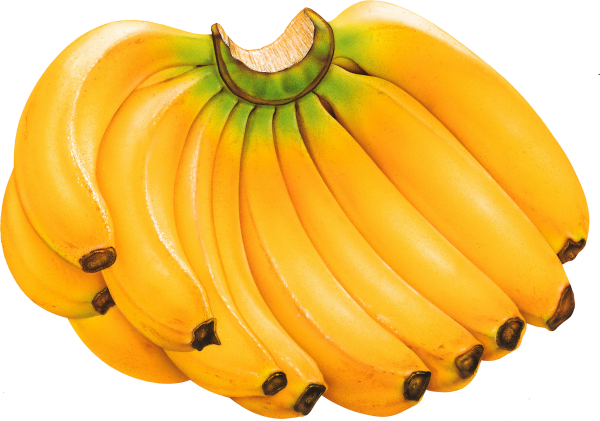 It is believed that there are almost 1000 varieties of bananas in the world, subdivided in 50 groups. The most commonly known banana is the Cavendish variety, which is the one produced for export markets. Bananas are grown in more than 150 countries, producing 105 million tonnes of fruit per year. The bananas grown for local consumption are generally grown in traditional, extensive systems. Dessert bananas account for 43 million tonnes per year and are of huge economic importance for many countries in the South. Cooking bananas (plantains and others) account for 45 million tonnes. Locally consumed bananas, which are a staple food in many tropical countries, play a major role in terms of food security. It is believed that the earliest written reference to banana is in Sanskrit and dates back to around 500 BC. Bananas are suspected to be the first fruit in the earth by some horticulturists. Their origin is placed in Southeast Asia, in the jungles of Malaysia, Indonesia or Philippines, where many varieties of wild bananas still grow today. Africans are credited to have given the present name, since the word banana would be derived from the Arab for ‘finger’. They started to be traded internationally by the end of fourteenth century. The development of railroads and technological advances in refrigerated maritime transport subsequently enabled bananas to become the most important world traded fruit. The inside of a banana skin can be used to polish shoes! Next articleDoes Water Melon Promote The Sperm Cell?